Day 2 is in the books. Yeah, not camping again. We were going to, I promise, but the KAO in Kankakee, IL was booked. I guess camping during a holiday weekend without reservations is not going to work. We are supposed to be at the KAO in Guthrie, IA tomorrow. I have to call them. Although with the 30% chance of rain showers tomorrow afternoon in Guthrie, we may just go hotel again. Can't beat Motel 6 for $60. I guess the spot locator is working. Today's ride was great. 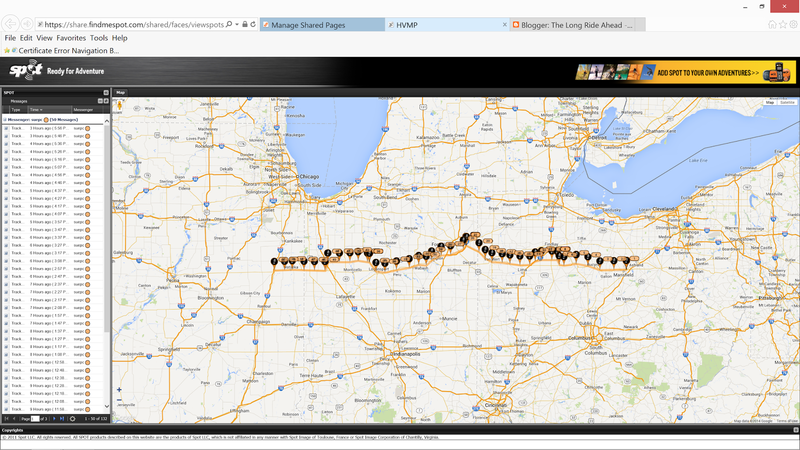 Basically due west from Mohican, OH to Gilman, IL. Indiana was great. We did a mix of highway and secondary roads which is nicer than all interstates. Some of the secondary roads were not part of the original route but we had to divert from the highway to find gas so then we decided to take any road that said west. At another point the GPS got a bit confused to we did the same thing. I find that we often have some of the best rides when we are winging it. We spent some time on the Lincoln highway. So many farms and windmills!! 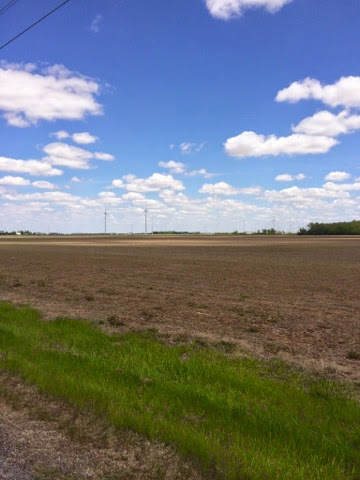 I saw signs upon entering Indiana saying "No Wind Farms" - I never realized that people could oppose wind farms. I will have to google that. Steve noted that he felt folks to be a bit friendlier in Indiana/Illinois than Ohio. We are sure there are great people in Ohio, it is just a note from our piece of the journey. I will say that people tend to be more open to just walking up to us to start talking about the bikes, the trip, the camelbaks, etc. We met a charming Irish hitchhiker and her cute as can be dog. She was hitching from Florida up to Michigan. She said it took her about five days so far, but she really had no idea what day it was so that was a guess. She said she got stuck in Atlanta for a day because "You know, it's hard to hitch out of the cities." Well, no, I was not aware that it was more difficult to hitch out of cities, but I will store that information for future reference. She told us some great places to stop along the way. She's a highway lurker, I guess because it's easier to get rides. She highly recommends Nevada City, she's never met an unhappy person there. Noted. I've got a lot of respect for the Irish chick hitching around the country. I would have loved to sit and have a cup of coffee with her, but the road called us all back. She's headed to Maine after Michigan. She wants to get a job for the summer so she can fly her and the dog back to Ireland in the fall. The cute dog guarding the stuff. Then a young man came up to talk to us as he was intrigued by the camelback water bladders that we wear. 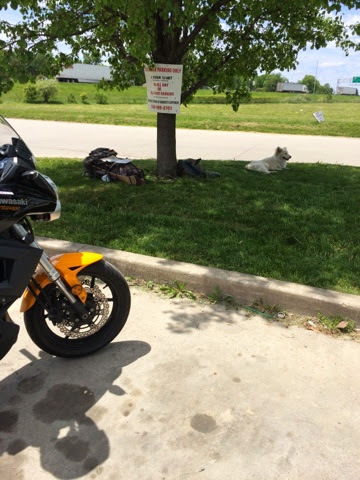 He had just gotten his license and was taking his first "long ride" from Fort Wayne, IN to Akron, OH on his Yamaha V-Star 650. Total mileage = 200. Good for him. Steve was also wondering how farmers pick that one tree in their field that they don't cut down. Is it arbitrary or science? We also determined that chickens smell worse than cows, but we don't think cows smell bad. Tomorrow we have a another 400 mile day much of which is GPS'd for interstate again as we make our big push west. Even though we are in this luxurious Motel 6 I can already tell I might in for trouble tonight with the screaming infant next store and the half-hourly freight train. Every time I see a farm with only one large, mature, tree standing in a field, I feel like I should go excavate around the tree for a jar of hidden loot. Why? Too many movies perhaps.